Alien Skin's Snap Art is a natural media plug-in for Adobe Photoshop ( ), Photoshop Elements ( ), and Photoshop Lightroom ( ). Geared toward professional photographers and graphic designers, creating fine art from a photo has never been easier. Using a powerful set of well-organized and customizable presets, you can produce amazing art with nary a manual brushstroke. 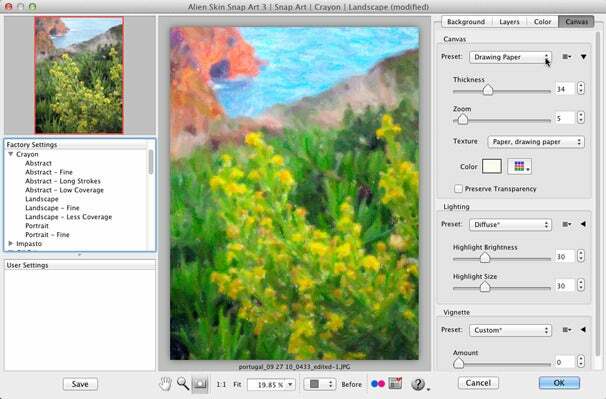 In Snap Art 3, you’ll find a streamlined interface, crayon presets, improved placement of brush strokes for more realistic results, and a Flickr uploader. Perhaps the most exciting feature in this version is the addition of a detail mask, which enables you to hide effects from important areas such as faces. Launch Snap Art 3 by opening a photo in Photoshop or Photoshop Elements, and then choosing Filter -> Alien Skin -> Snap Art 3 (the Alien Skin category is new in this version). In Lightroom, select your image(s) and then open the plug-in by control-clicking and choosing Edit in Alien Skin Snap Art 3 (Photoshop and Elements do not support batch processing). Once the plug-in opens, you’ll notice a streamlined interface with hundreds of presets on the left—use your arrow keys to peruse them—and a large preview area in the center. Tools beneath the viewing area let you pan and zoom, as well as add a layer mask (more on that in a minute). On the right side you’ll find settings that let you fine-tune effect presets with controls for paint coverage (so more or less of the canvas shows through), paint thickness, stroke color variation, color saturation, canvas texture, lighting, and more. These settings are categorized into clickable “tabs” and include Background, Layers, Color, and Canvas. Each tab contains a preset pop-up menu as well as multiple sliders for even more customization (hover over each slider for a descriptive tool tip). Sure there are a slew of sliders, but the video tutorials on Alien Skin's website are incredibly helpful. By using detail masking, you can apply an abstract effect to your photo while keeping faces recognizable. Snap Art 3 lets you create up to three layers, each with an individual mask. This is helpful for fine-tuning effects in specific areas of your photo in different ways…an absolute must for portraits. For example, by using masks you can apply more of an abstract painted look to the background of your photo, yet retain detail and photo realism in your subject’s face. To add a mask, click the circle within a square icon at the bottom of the Snap Art interface (it’s identical to the mask icon in both Photoshop and Photoshop Elements). Mouse over to the preview area and paint across any areas you don’t want affected by changes made with the settings on the right side of the interface. 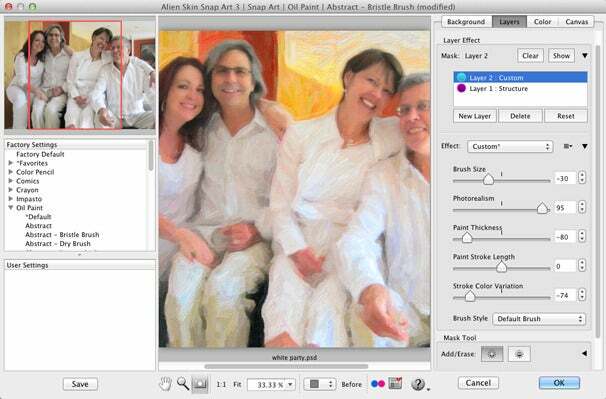 As you paint, your brush strokes appear as a magenta overlay (toggle the overlay on or off by pressing M). The program automatically switches to the Layers tab on the right, too, which contains controls for refining the effect and the mask itself. Click the tiny triangle to the right of the Mask Tool area and you’ll reveal even more options for changing mask softness and strength (think opacity). Once you’ve added a mask, use the Effect pop-up menu to change the way the masked area is handled (choose Detail to apply fewer effects to the masked area). Click the triangle to its right to reveal even more options for fine-tuning your art. Once you’ve added a mask, it’s preserved while your photo is open—even when experimenting with other presets. Once you’re happy with the effect, save it—and your mask—by pressing Command-S (it appears in the User Settings area at bottom left). Clicking OK closes Snap Art 3 and lands you back within Photoshop, where you’ll spot a new layer containing your art (new in this version). Lightroom works a little differently and makes copies of your images for use in Snap Art; you’ll spot the new art-worthy images next to the originals in your Lightroom catalog (though you can force it to edit the original if you like). Also new in this version is a handy Flickr uploader for sharing photos online. Using the new crayon preset, you can take a photo from flat to fabulous in minutes. If you’ve ever had the hankering to turn a photo into a painting, you’ll love this software; the interface is friendly and you can produce amazing results fast. If you’re a photographer looking for additional creative products to sell to clients, Snap Art 3 will make a profitable addition to your studio. If you’ve been using it previously, the new interface and detail masks are worth the upgrade. And yes, if you had unlimited time and patience, you might be able to recreate similar effects using a variety of Photoshop’s filters, but why bother? Using Snap Art 3 is both efficient and fun.